Can you give the reader’s a little background about yourself? Sure, I am a tech geek at heart. I’ve been studying technology from my days at Brooklyn Technical High School to getting my Bachelor’s in Computer Science at Columbia University back in 2002. I truly enjoy the web, which is why I decided to build my first website Multiple Shades of You Online (www.msoyonline.com) back in 2000 and I’ve been building websites ever since. Positive work inspires me most. When I built my first website my vision was to create a space to showcase positive content for people of color. In my 10 plus years working online I’ve been motivated to support those committed to sharing their vision and helping other people actualize theirs. What made you start a design business Pretty Professional Websites? I’ve always had an entrepreneurial spirit, but in a way I fell into entrepreneurship. After creating my own websites, people started asking me to build theirs or help them learn how to market online and in the process my career as a full time web developer, blogger and online mentor began. Having built my businesses on a ‘floss string’ budget I created Pretty Professional Web Design Services so that I could create quality sites for people on small budgets. I don’t think one should have to sacrifice quality for lower cost. Now, you are a designer. How in the world did you come up with such a powerful entrepreneurial movement like SistaSense? I jumped onto blogging when it was still very new. Before the age of turning blogs into businesses, most people simply used them as online journals. 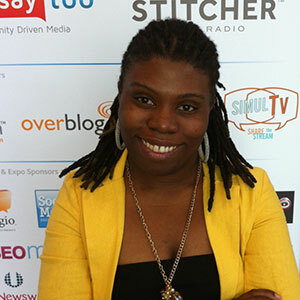 SistaSense was originally my space to share my journey of making sense of making money online. Eventually my readers became followers, mentees, clients and friends who wanted to learn my strategies and mirror my success in their own web ventures. You help thousands of women entrepreneurs create a better business for themselves and their families. Can you share with us how you combine both of your passions? Via SistaSense I offer a variety of services because every entrepreneur I meet has different needs. While some are in need of my services as a web and/or graphics designer, others are more interested in my mentorship services through calls, webinars and live workshops. Perfecting my craft over the years has allowed me to both coach and create for clients in a very fulfilling way. What do you feel holds women back in this industry and how we can overcome it? Expectations hold us back. Whether it be external companies or clients who don’t expect a women to be able to get the job done OR internal fears women designers have that prevent one from diving into unfamiliar positions; expectations often hold us back. I personally couldn’t find my ideal tech job, so I created it for myself and in the process showed others they could do them same plus seek out other women designers too. My biggest challenge was not knowing how to navigate the tech/web world well enough to get hired for traditional technology gigs. For that reason I turned the world wide web into my wild wild west. I was determined to claim my own digital territory, build my design skills and start my own business. If you can do something differently in your business what would it be? A great deal of my experience as a web designer and entrepreneur comes from what I taught myself. Life is the greatest teacher, but if I could do things differently I would have loved to have mentors who could have helped me plan my vision more strategically and avoid unnecessary mistakes. You have designed websites, book covers, banners, social media designs, and more for several different companies and entrepreneurs in different industries. In your professional opinion, do you think designers need to find their niche and/or narrow down their target audience? If so, why or why not? I definitely think designers need to find their niche and a clear target audience. My services have evolved over the years but I focus solely on those areas where I have the most experience. My graphics design for example focused more so on web graphics (where my experience is) vs print graphics. I have experience customizing Ning networks and WordPress blogs, but there are a few platforms that I don’t work in at all. Being creative I dabble in other areas every now and again, but every designer should have specific projects and platforms that are at the core of their business. You are a marketing expert, teacher, and designer. Name the top online or offline tool(s) you can’t live without? As a designer I don’t think I could love without Dreamweaver and Photoshop. Online WordPress, Ning and PayPal are a few sites that I frequent daily. What is in store for LaShanda a year from now? 5-10 years from now? I am a web tech girl at heart, but in the coming year I do hope to do more offline workshops as well as work more on my SistaSense Magazine. Tell us creative entrepreneurs how we can get involved with SistaSense Power Circle. My SistaSense Power Circle is always growing and all are welcome. Inside the circle I offer weekly sessions (both calls and webinars), plus I do training webinars and live conferences throughout the year. Whether I am hosting my own training sessions or connected entrepreneurs to other professionals who can help, I always have something to share on SistaSense. Thank you for your time LaShanda. You are truly an inspiration to other designers in the world and I appreciate you taking the time out of your busy schedule to interview you. From your friends at Inspiring Black Designers Blog!